We Balaji Sports Co. only One Manufacturing Firm in India dealing in Tennis Floor Coating. With our in-depth industry experience and knowledge in the respective domain, we are affianced in manufacturing, supplying, and exporting pristine quality Tennis Floor Coating. This offered paint provides hard, shiny and attractive finish to the tennis surface. In addition with it, due to such specifications, this paint is widely used on the outside surface of the wall to make the structure appealing. The offered paint is processed in our well-maintained processing unit using quality-approved materials and innovative methodology. Balaji Sports Co. and its brand “PACE Court” established in the year 2012 is a brain child of a most experienced professional worked in the field of Synthetic Sports Surfaces with renowned international brands from the last 15 years in India. After doing a numerous projects of supplying and laying synthetic sports surfaces in all over India, we felt the need of an indigenously developed product range of sport surface material for our growing market. With the help of some international consultants and a team of experienced professional of the chemical industry, we could successfully develop our first product range of synthetic sports coatings, suitable both asphalt and concrete surfaces. These products are suitable for all type of outdoor sports, recreation, decorative surfaces like Tennis, Basketball, Badminton, Skating, Walking Track, Multipurpose Sports grounds etc. We provide our products under the own brand name PACE Courts. 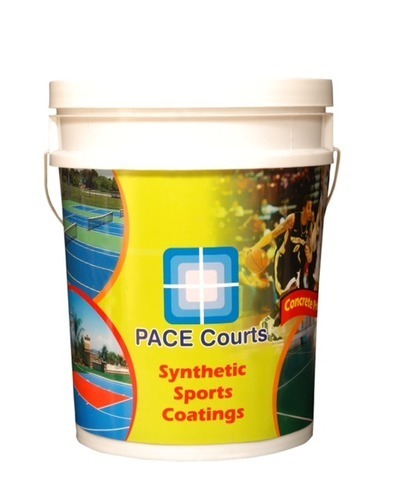 PACE Court sports coating products feature 100% Acrylic Resins are high quality non-slip surface coating for sporting recreational areas. It is a balanced formula of highly durable adhesion promoted acrylic resins, UV resistant oxide pigments, selected reinforcing fillers and fungicides. It also has excellent color retention, UV resistance and extraordinary wearing purposes. Tennis Court, Basketball / Netball Courts, Badminton Courts, Pool Surrounds, Pathways / Walking Tracks, Rollerblade, roller skate, and skateboard parks, Playground surface coating, Multipurpose court (heavy use or multi sport).